Hawken School is pleased to announce a new program for toddlers from 18 to 36 months beginning in the 2019-2020 school year. Students accepted to Hawken School who turn three between October 1 and December 31 will now become part of our toddler community, and students who turn 3 by September 30 will be enrolled in our preschool program. True to Hawken’s beliefs about children, the toddler program will be, at its core, child-centered. In designing this program, administrators and teachers drew inspiration from the work and research of early childhood educator Magda Gerber and pediatrician Emmi Pikler. Both women were instrumental in changing the landscape of interacting with infants and toddlers. Their philosophy is grounded in treating the young toddler with respect and by trusting in his or her ability to engage, explore, and learn in a way that is natural and uninhibited. Create physically and emotionally safe learning spaces that are intentionally designed to nurture cognitive stimulation. Provide sustained, uninterrupted time for toddler-initiated play, exploration, and discovery. Encourage the child to freely engage and interact with other children. Allow the child to become engaged in all activities by encouraging active participation instead of passive observation. Understand and respond to the child’s needs through careful and sensitive observation of his or her behaviors and interactions. 1.Bence Gerber and Lisa Sunbury (editors), Magda Gerber, Seeing Babies with New Eyes, 5/1/2012, accessed 11/30/2018, https://www.magdagerber.org/blog/magda-gerbers-rie-philosophy-basic-principles. This approach sends the essential message to the child that he or she is capable. Teachers trust children to initiate interactions with their environment and peers while respecting their need to explore and engage with their surroundings in relatively unhindered ways. This kind of freedom - offered in the context of an intentionally designed space allowing for physical and emotional safety, and cognitive stimulation - promotes active over passive participation, allowing the child to explore, interact, and learn with others at their own pace and according to their own will and desire. Because space is limited, enrollment in this new program is not guaranteed. Please note that tuition remission is not available for this program. Hawken teachers focus on creating a physically and emotionally safe environment that sets the tone for the development of your child’s innate curiosity and nurtures confident, positive attitudes toward school. Emphasizing a student-centered approach, teachers tend to each child as he or she makes discoveries and observations about our world. Your child’s connection to the Hawken classroom and the school is reinforced in everything we do. Through reassuring routines that include greeting each child by name every day during morning meeting and a hug or handshake from the teacher at the end of the day, your child will quickly come to understand that he or she is part of a warm, accepting community. Your child will also learn about expectations of individual responsibility, respectful language, and an appreciation for differences. The sense of empowerment and pride instilled through this feeling of belonging will inspire in your child the confidence and desire to make a difference in his or her classroom and beyond. Click here to learn more about our Early Childhood learning spaces. For more information about the Toddler Program at Hawken School, contact Brooke Marcy at 440-423-2074 or email bmarc@hawken.edu. Hawken opened the doors to a stunning early childhood center in August 2011, with a celebration that included a keynote address from renowned education expert Dr. T. Berry Brazelton, Professor of Pediatrics Emeritus Harvard Medical School and founder of the Brazelton Touchpoints Center at Children’s Hospital Boston. Click here to learn more about Hawken's Early Childhood Center. To learn more about our Toddler Program, schedule a tour of our campus. 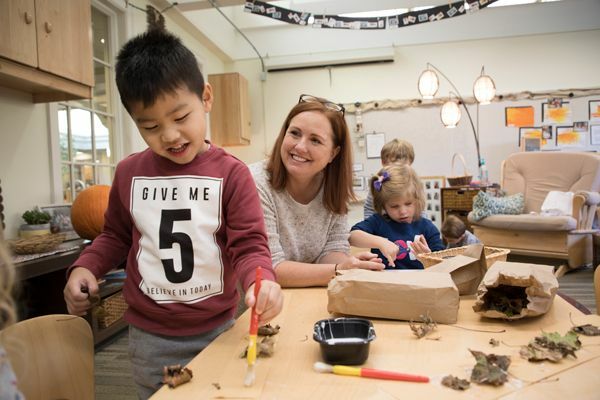 The Early Childhood program at Hawken School focuses on five domains of development: Social-Emotional, Approaches to Learning, Cognitive, Language and Literacy. These domains encompass the core academic disciplines, addressing each subject area from a developmental perspective, because each child progresses at varying rates within each discipline. The specific academic skills addressed at each level are outlined on the curriculum skills grid. The Social-Emotional Domain addresses the development of social skills and emotional competence, one of the most important goals in early childhood education. Children need these skills in order to achieve academically and to maintain relationships within the community of the school and throughout life. As students progress through the continuum, they develop social skills that provide the foundation for forming lasting relationships that are essential to emotional health, which encompasses the development of personal identity, self-esteem, expression and control of emotions, management of frustration, and perseverance. The Approaches to Learning Domain describes the ways in which children move toward, interact, and reflect upon life experiences. The skills and attitudes children bring to their early school environment have a major impact on the approach they take when “learning how to learn” and can be developed by a learning environment that nurtures initiative, engagement, persistence, curiosity, reasoning, problem solving, invention and imagination. The Language and Literacy Domain addresses the skills of listening, speaking and writing. Language skills provide the foundation for a wide range of abilities that will be used in both social and academic situations throughout life. This acquisition is a natural yet complex process, and its ultimate goal is effective communication skills and literacy; and the use of language to convey meaning through reading and writing. Competency continues to develop throughout the early school years as formal reading and writing instruction takes place in the classroom. The Cognitive Domain addresses the acquisition, storage, and retrieval of information. The Cognitive Domain encompasses math, science, and social studies. Key characteristics of the cognitive domain are knowledge of physical properties, knowledge about relationships and knowledge of cultural conventions; the primary cognitive processes are attention, memory, trial and error, cause and effect, reasons and problem solving, and prediction and estimation. Physical Development is a significant aspect of growth in the early childhood years and provides avenues for the way in which children explore their surroundings. This domain includes small and large motor competence as well as sensory awareness.